This entry was posted in Articles, Articles & Reviews, Reviews on 22 novembre 2017 by Anne-Louise Mikkelsen. 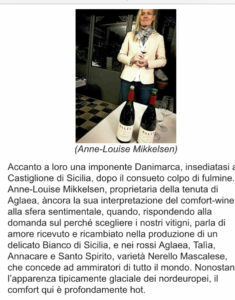 This entry was posted in Articles, Articles & Reviews on 21 novembre 2017 by Anne-Louise Mikkelsen. This entry was posted in Articles & Reviews, Reviews on 21 aprile 2017 by aglaeaAdmin-Usr. This entry was posted in Articles, Articles & Reviews on 21 aprile 2017 by aglaeaAdmin-Usr. The Drinks Business – Nerello Mascalese – an alternative classic? This entry was posted in Articles on 27 febbraio 2017 by aglaeaAdmin-Usr. This entry was posted in Reviews on 27 febbraio 2017 by aglaeaAdmin-Usr. This entry was posted in Articles, Articles & Reviews on 27 aprile 2016 by Anne-Louise Mikkelsen. This entry was posted in Articles on 26 marzo 2015 by aglaeaAdmin-Usr.